Submitted by Snafulator on 2018-10-16 23:04. Just go to 'Advanced' -> 'Variables' while editing a placeable and enter a new integer with the name 'VFX_NUM' and the value as the number matching the effect you want to apply (check the vfx list @ https://nwnlexicon.com/index.php/Vfx_dur). Let me know if you have any issues implementing this in your modules. 4. 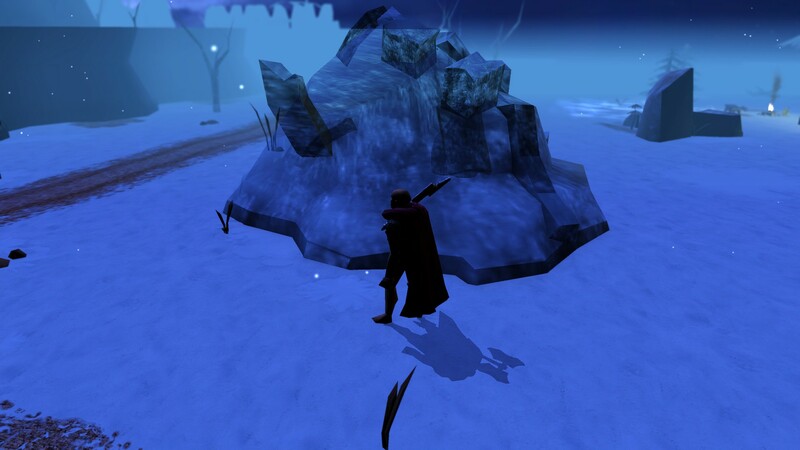 Place some of these ice boulders in the area with the OnEnter script. You can add nearly any effect to a placeable via VFX_NUM (some effects will not display e.g. ShadowSkin). Something to keep in mind is that some of the VFX, such as ice skin (pictured) and shadowskin, have alpha transparency in their textures, that may be desired for "reflective" shiny texture appearance. Many of the placeables that do not have alpha information in their textures do not have environment maps specified in the placeables.2da, so therefore, the use of the alpha in those progfx reskin textures will make them transparent (pictured) instead of shiny. Changing the Envmap field in the placeables.2da from **** to "default" (no quotes) will enable reflections using the environment map listed for the current tileset. Thanks Symphony! I'll see if i can add in the 2da files + override installation instructions.